Once you've downloaded the installer to your computer, you need to run it. Simply double-click on the installer file to start it. Make sure you close any other program you may have running. If you want to keep this page open in a browser, while you install SeaMonkey, it would probably be best to use Internet Explorer for reading this page. 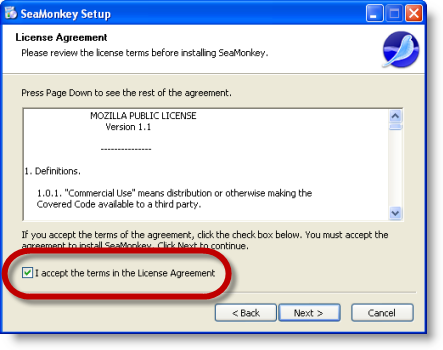 After you've closed other programs, click on the "Next" button, which should then bring you to the software license agreement. It's never a bad thing to read the agreement. Once you've finished, and choose to accept the agreement, click on the Accept button. You will then be taken to the setup type options. My personal recommendation is to choose the Standard option. 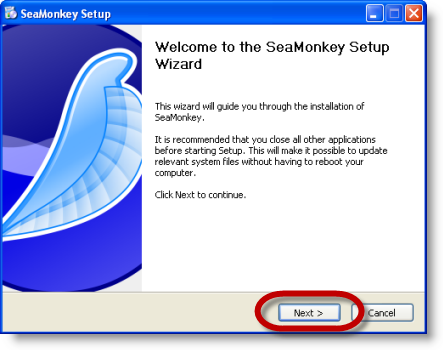 Choose the Custom option if you want to customize the destination folder, and where SeaMonkey icons are created. 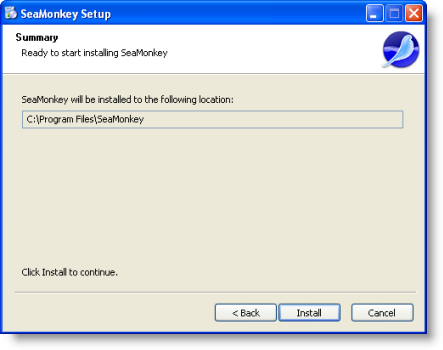 The installer will tell you which folder SeaMonkey is being installed in. Click on the "Next" button. 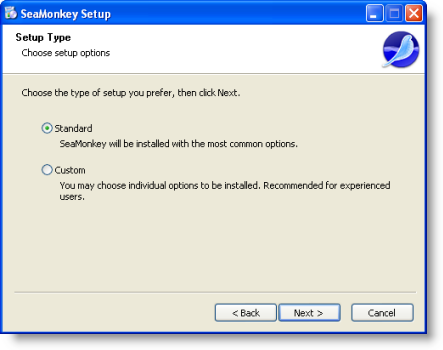 The installer will then install SeaMonkey. Once the installation is complete, close the setup wizard by clicking "Finish". If the "Launch SeaMonkey now" checkbox is checked, SeaMonkey will start for the first time immediately after you click Finish.